Review: In 'High Flying Bird,' Soderbergh Unlocks An NBA Lockout A new Netflix film directed by Steven Soderbergh follows a sports agent who's trying to stay afloat and keep his clients happy during an NBA lockout. 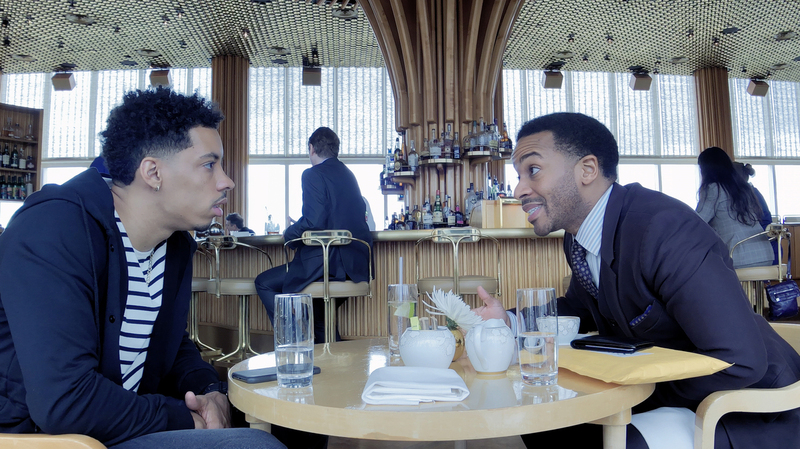 We meet sports agent Ray Burke (Andre Holland) in the glittering bar at the top of The Standard, a Manhattan hotel that looks out over the High Line. Surrounded by huge windows, Ray sits across from his client Erick (Melvin Gregg), a rookie who's signed to play for New York. Erick isn't getting paid yet, and he's not practicing with his team yet, because there's a lockout. The owners and the players are at a stalemate, and Erick has gotten panicky that he'll go broke before the game starts up again. Ray isn't happy about how he's handled that panic, and delivers unto him a righteous verbal takedown of his judgment, his naivete, and his failure to understand the business of professional sports. All of the new Netflix film High Flying Bird is about the business of sports. Written by playwright Tarell Alvin McCraney (whose play became the best picture winner Moonlight) and directed by Steven Soderbergh, it's a sports movie that doesn't concern itself with any of the fun stuff. Just the bad stuff. Just the contracts, and the lockouts, and the negotiations, and the networks and agents and exploitation of very young and mostly black men who make absurd amounts of money for absurdly wealthy owners who couldn't dribble a basketball from one end of their six-car garage to the other. Ray is on shaky ground with his own agency, because they're not bringing in money during the lockout and things are getting desperate. (How desperate? Ray's corporate card stops working, leaving him to pay cash for a client lunch and walk back to the office because he can't call a car.) The players' association representative, played by the divine Sonja Sohn, doesn't think the lockout will end any time soon. The owners feel no urgency. The players would seem to have little power. All they can do is keep not playing, not earning, not competing. This is the setup for a very unusual and very fine film that's simultaneously about changes in media, the disproportionate power of zillionaires in general, limiting the power of players by trying to own their very existences, and the elements of white supremacy in general and slavery in particular that burrow deep into parts of professional sports. Holland's portrayal of Ray is restrained but impassioned, and as would be the case in real life, there is no clear line between the action he takes in the interests of his clients and the actions he takes in the interests of himself. This is, in fact, how agency should work, to a degree: Align the interests of the agent and the player, and the agent saves his own pocketbook by saving the player's. Soderbergh shoots Ray in all manner of seated positions, from a variety of angles. He is always making a place for himself at whatever table is handy, and he keeps his cool whether we are looking slightly upward into his jaw, or downward past his forehead into the repeating patterns on the floor of the bar at the Standard. And one of the strengths of the script is that it's not only Ray who gets to succeed — it's not only Ray who gets to be right. He has an assertive former assistant named Sam (Zazie Beetz of Atlanta, who's just wonderful), and Sam also has a role to play in Ray's efforts to keep Erick cool until the lockout is resolved. She's a bit of a cipher at times; a character who both wants approval and doesn't require it. She admires Myra, and wants to be her — maybe. She understands Ray, and wants to help him — mostly. She also cares about Erick — at some level. But one of the things that's most welcome in High Flying Bird is that even as it shouts in new ways, with new anger, about the inequities of a business that takes the power and financial rewards of basketball away from the very people who can actually play it — what Spence calls the game on top of the game — it doesn't pretend that no one has thought of this before. It quite correctly sees Ray's problems, and Erick's, in the context of a whole legacy of black athletes and activism. In fact, it specifically references the 1969 book The Revolt Of The Black Athlete, by Harry Edwards. McCraney and Soderbergh are not pretending that exploitation of black athletes has just been discovered or that they are delivering brand new insight or brand new connections between professional sports and slavery; they are applying it to a new story in a new way. Bill Duke's role as an old-timer who operates a basketball camp, and who has strong feelings about athletes and slavery metaphors, provides another angle of inquiry for this part of the story. High Flying Bird does require close attention, because it assumes some familiarity with lockouts and negotiations, and it might take a little patience to follow some of the faster-moving plot points. And sometimes, complex motives are just that — complex, and not explained. It's the kind of film you can have a long conversation about at the end, trying to figure out who is right, who is going to prevail, and what would have to change to bring about the future that Ray is trying to create.